Can’t believe it was January the last time I blogged – clearly I’m not very good at keeping the blog updated but I have a few photos of some of the work that I have been doing over the last few months which I have added to the website. I finished this commission in May for a Church in Wales commemorating those fallen in World War I. 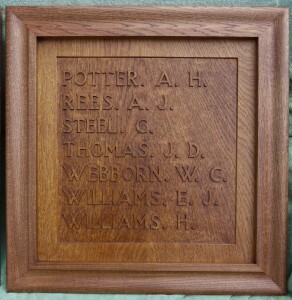 The carved lettering on the solid Oak panels for this commission was unusual in that it was carved in low relief rather than the usual style of incised lettering. More photos can be viewed by visiting the Lettering page of my website.